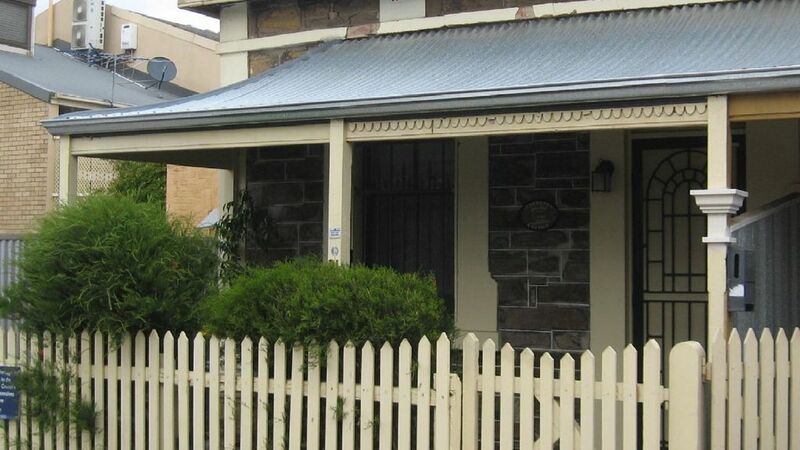 Located in the South East East corner of Adelaide City (South Australia) Harriett's Cottage is a great place to stay. Harriett's Cottage is a 2 bedroom and 2 bathroom fully furnished Cottage. Harriett's Cottage is great for family, holiday and business stays. It has two bathrooms (main bedroom with ensuite). Both have walk-in showers, and heat lamps. Harriett's has a lounge and separate eating area. In addition it has a separate fully funtional kitchen. Kitchen includes a full stove, microwave and fridge freezer. As well as the full kitchen and BBQ is available for cooking. If preferred there are a number of nearby eating venues from the fast food to fine food. Harriett's Cottage is part of Harriett's Cottage Accommodation. If this one doesn't suit your requirements or the the dates are not available we do have Kybunga by the sea (3 bedroom) by the Largs North Beach, or Clyde's Cottage Parkside (all 2 bedroom about 1 km south of the city) , or Cottage SixtyA in Adelaide (One bedroom, in the South East quarter) and that maybe be available through the Homeaway website. South East corner of Adelaide City is close to city centre. Harriett's Cottage is close to the heart of the city, south parklands, hospitals, Central Market and Hutt St precincts. It is a short walk, or free bus ride, to the city shops. Tariff for extra people are $20 a night for adults and $10 a night for children 2-16 years. Homeaway service fees are in addition to the above. Good location, quiet street. Quaint cottage. Good location. Would stay there again. Close to city, clean and tidy, quiet and overall really lovely. Everything you need is in the house and hosts were kind and very helpful. Would definitely stay here again. We stayed at the cottage for three nights in July. So pleased that checkin was easy when we arrived at midnight after our plane had been delayed. The bed was comfortable, everything including the heating worked well. The kitchen had everything we needed to prepare our meals. Transport was nearby, as were several supermarkets. Would love to stay here again. Wonderful hosts. Fast internet. Good location. A wonderful cottage. Felt like home away from home. Simple checkin and a lot of very thoughtful touches. I will stay here again. Thank you for your feedback. I am glad you found it very comfortable and great value. We do have a small fee for wifi; but sorry no Foxtel.